I'm keeping it simple today. It's too hot to cook anything elaborate anyway. Yesterday it hit 91 degrees here and today and tomorrow are supposed to bring more of the same. Yuck. I have to say I don't like the hot, muggy, sticky days of summer. But I'll tell you what I do like...Green beans. They just seem to have endless possibilities. This is just a simple recipe that is so easy to throw together on a busy work night. I prefer to steam my veggies because more of the nutrients are retained, but feel free to boil them if you prefer, to your desired tenderness before sauting them in the garlic tomatoes. Steam or boil green beans in salted water until tender, about 7 minutes steamed and 5 minutes boiled. Add 2 teaspoons oil to a medium skillet add garlic and cook over low heat until soft but not brown, about 5 minutes. Add tomatoes, salt and pepper and cook about 2-3 minutes. 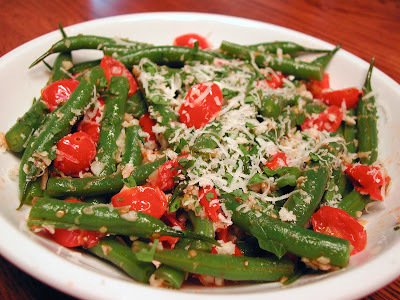 Add green beans and cook, mixing to incorporate flavors, about 3-4 minutes. Remove pan from heat and add Romano cheese, breadcrumbs and parsley. ugh...I agree about the heat! We have been in the 90's for a couple of weeks. That does not bode well for August and September, which are typically our hottest. I hope the is just early heat and not a shift in the actually maximum heat! The green beans look great! Yes, it's been hot here too. This looks nice and refreshing. I love green beans. My parents fix them slow-cooked, but I prefer steamed. I love the sound of this! Anything that keeps the house cooler is good right now.